A human-created virus has infected humankind, mutating most into super strong, near-immortal vampiric creatures. The "virals" - also called "jumpers" - and "dracs" (after Dracula, of course) - can leap 20 feet through the air at a bound and split a human (or a horse, or a cow) in half with their bare hands. A small band of men and women embark on a cross-country trek, looking for a way to protect the few remaining uninfected humans from extinction. With them travels an enigmatic prepubescent girl who talks to the virals with her mind and seems to have been born 100 years before. 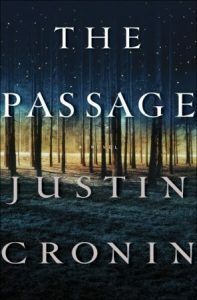 If you like the intense terror The Passage provides, check out these intriguing apocalyptic fiction titles. Draco Incendia Trychophyton: a highly contagious spore that spontaneously sets its victims on fire. The world as we know it is suddenly aflame without a cure, and society breaks out into hysterics, forming mercenary groups to extinguish the infected. Harper Grayson, a kind and generous nurse with Trycho, discovers she's pregnant during the outbreak. With little hope and no remaining friends, she turns to a mysterious fireman who can control the disease with a flick of his wrist. In this postapocalyptic novel, a father and his son walk alone through burned America. Their destination is the coast, although they don't know what, if anything, awaits them there. They have nothing; just a pistol to defend themselves against the lawless bands that stalk the road, the clothes they are wearing, a cart of scavenged food - and each other. One snowy night a famous Hollywood actor slumps over and dies onstage during a production of King Lear. Hours later, the world as we know it begins to dissolve. Moving back and forth in time-from the actor's early days as a film star to fifteen years in the future, when a theater troupe known as the Traveling Symphony roams the wasteland of what remains. View more suggestions for The Passage series.